A $2 daily parking fee will go into effect on Aug. 28 at the El Monte Bus Station and the Gold Line’s Atlantic Station. The monthly permit pass at Atlantic Station will remain $29. Monthly permit passes at El Monte Station will be available later this year at $39. 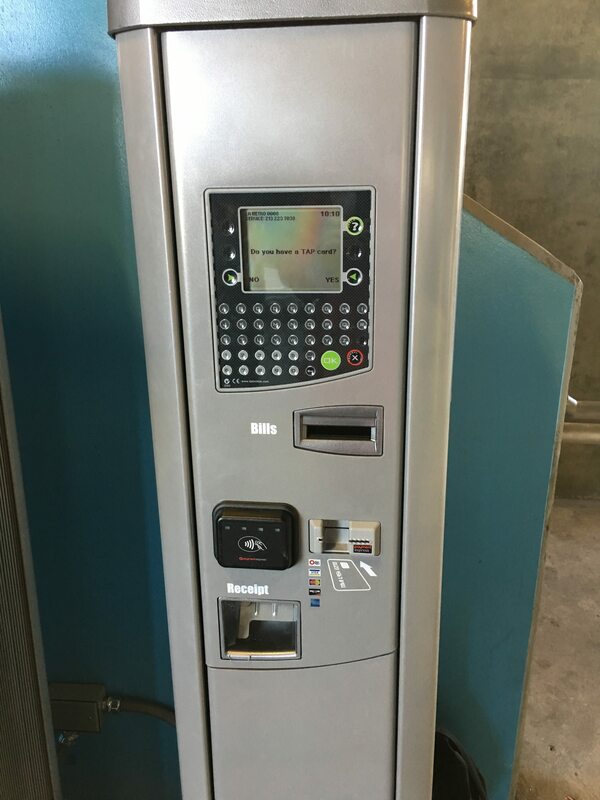 Stations will have the automated pay systems that are in use at other Metro pay parking lots. Riders will need their license plate number, a valid TAP card and either cash or credit card to pay. Metro also has a smartphone parking app that can used to pay the fees. The app is now available in the iTunes store and the Google Play store (there is a 15 cent fee to use the app so parking is $3.15 a day). 1 — Find a parking space. 2 — Pay with the app or find the nearest pay machine. You will need both your license plate number (tip: take a pic with your smartphone if you haven’t memorized your plate) and a valid TAP card. The app requires a credit card. The machines accept cash or credit cards. Note: new transit riders are given a one-day grace period to get a TAP card, which are available at TAP vending machines at both stations. Why do you need your license plate number? Cameras take a picture and recognize the license plate on each vehicle as it enters the lot and the payment system uses the license plates to verify that payment was received. The cameras also make the system more convenient as there’s no need to return to your car to put a receipt on the dashboard. • The $2 fee covers 24 hours of parking. You can park at either station for up to three days at $2 per day. • Failure to pay will result in a $53 citation. • Existing monthly permit holders will have their permits automatically converted to the new system. • Those who want to sign up for the waiting list for a monthly permit can do so at LAMetroParking.net. The same site also offers carpool parking permits that allow patrons to split the cost of a monthly permit between two or three people. • For those who need to pick up or drop off friends or family, there is a 15-minute grace period where you can enter and exit the lot without being charged. • Specific to Atlantic Station: non-transit riders will be able to park there after 11 a.m. at the rate of $3 for 3 hours. You can also check out this FAQ for more info. The idea behind the program is not to make money, although it may generate a small profit. Rather, the fees are being used to manage demand and create more parking for those who actually use transit. Metro parking officials emphasize that they’ve found that a small daily fee along with the TAP card requirement opens up parking spaces — and helps prevent the need to build even more parking, which is a very expensive proposition. I feel that this should be done by not charging if the TAP card associated was used a minimum of 2 times in a 24 hour period. This seems like it would reduce other people parking and wouldn’t punish people who take transit. I hope you can direct us to a more complete write-up for El Monte Station parking details. LAMetroParking.net does not list that station as paid parking yet and for something that will happen in a month, I need more information before deciding next steps. My questions are as follows: 1. There are several different lots for the station which is expansive. Are all lots scheduled to be charged? 2. Is there a charge for off-hours usage (after 6 pm)? And as more of a policy question, currently the southern lot that is the most remote is half occupied by car dealership storage parking. Shouldn’t that be freed-up for transit patrons? Thanks! At least for me, the mental calculus is this: It costs $5 per round trip currently to park at El Monte and go to DTLA. I use it most frequently in the off hours from 6-10p. If there is a $2 parking charge in effect around-the-clock, I’d have to seriously consider driving it every time and I don’t want to add to the congestion. The feeder 268 route runs within walking distance of me, but it stops after 8 pm and doesn’t work for late evening trips. The 1-hour headways on that line always made it a bit of a joke to begin with and I only save that for the last resort. This is just a money grab!! While there maybe good reason to charge for parking Mon-Fri, there is NO reason to charge for parking on weekends, when the Atlantic lot is 95% empty most weekends!! El Monte Station has a lot of empty parking and a lot of vanpoolers. The lots near the station are often full but the south lot, on the former car dealership grounds, is empty. Also, street parking in the area is completely unrestricted. Also, El Monte is an old Caltrans lot, and how will people who want to attend public hearings or Sector Council meetings going to park? Meanwhile, paid parking is not being implemented on the Green Line lots which fill up before 7 am every day, like Lakewood and Norwalk. This is not going to go well. Ah, cheap parking, the reason LA is such a disgusting, hostile place. And people still complain about $29 monthly passes. Give me a break! That doesn’t cover a fraction of the costs, let alone the externalities of Angelinos being addicted to their cars and using them for 85% of trips less than 3 miles long. Pathetic. LA is stuck in the 1950s. If you are trying control people from not parking there if they are not taking transit, at least, this fee should be exempt for transit riders. I might as well add to the congestion because the fee for parking and the bus from El Monte to downtown would total $139 per month, I might as well pay for parking in downtown. And, “opens up parking spaces”? Please take back the parking spaces you rent to the local car dealerships if you need more. Does any of the board members or their cronies take public transportation? Does the CEO or any of the EO’s for Metro there take public transportation? No public appearances does not count. Sometimes it’s just not feasible to take a bus to a rail station. Remember these are the fools that think for the now (three car platforms for light rail lines at grade), rather than the future. Also, how dumb is it to charge the El Monte and the Atlantic stations.. They are not the most affluent areas. can’t say much about the other areas. The idea of charging parking fees to park at the El Monte Station to ride public transit is ridiculous and is very unfair. I thought that public transportation created to save people money; not creating congestion on the roads; and free of air pollution. This is nothing more than a political gain. Don’t tell us that you’re not making money; we’re not a bunch of idiots. You guys will charge $2 per day at first and then what, raising the price from there as the days and years passes? You’re charging $2 per day, that’s $60 per month, and is $720 per year per customer! If you have 100 customers paying $2 per day, that’s $200 per day, $6,000 per month and times that by 12 months that’s about $72,000 per year! I’m already paying $5 round trip per day that equals to $150 per month and now adding this $60 to my monthly transit fees would cost me $210 and that’s $2,520 per year. If the 100 customers are paying $2,520 per year and times the 100 customers, that’s $252,000 per year. Also to use an excuse to say that you’re trying to manage demand and create more parking for those who actually use transit, then why don’t you take a different approach rather than punishing those who use public transit. For example, come up with a policy with more strict rules for parking at the lots, and that you will issue citations to those that park at the lots illegally. I’d also like to add that you guys are hiring a bunch of lazy security guards. They’re not doing their job. They don’t walk around to check. They don’t bother to tell people to not park at the loading zone; there are cars lining up as far as the pedestrian’s walkway. They are on their cell phones inside the transit store and while they are on their mobile cart. They’re just standing around talking. The employees at the transit store are taking their time to assist customers and are not friendly. There will be a lot people deciding to drive to work again instead of taking public transportation because you guys decided to change the rules and charge for everything. One of the reason I’m taking public transportation is because it’s convenient, affordable, and very green. With the added parking fee of $2 per day is not much, but for commuters like me who take the Silver line to downtown LA everyday to work, it adds up. This will cost me an extra $40 per month. Multiply that by 12 months, it comes out to be $480 annually. Add this to my $100/ month for bus fare, which comes at the expense of $1,200 annually. My grand total for public transportation will go from $1,200 to $1,680, an increase of 40%. My work place subsidizes my parking in downtown LA so I only have to pay about $50 per month. I’m seriously considering that since I don’t think I’m saving much by taking public transportation. I park there every morning. I am sorry to see that they are getting greedy. To this date, I don’t see any indication that the infrastructure for this system has even been laid. It is 8/7 now, and this is supposed to be up by 8/28? not much time left. We can only hope that, like other things (new lines being implemented) that it will be delayed indefinitely. i don’t think that they can get it done by 8/28…don’t see any starting on it.